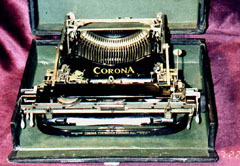 TY-352 - Corona Folding Typewriter. The Patent date on the back plate is June 10, 1913. Weighs 10 lbs and is in its original case. The case needs alot of help. 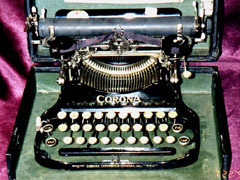 Part of the case is holding on by threads but it does close properly protecting the typewriter inside which is in working condition. The specs are 10 x 12 x 4-1/2. Price $225.